Dennis Sturgell stands in front of his boat Fierce Leader. Crab fisherman along the West Coast are facing a weak season. An unusually weak Dungeness crab harvest is compounding the financial woes of West Coast fishermen who were already struggling with depressed consumer demand and the unprecedented collapse of the Pacific chinook salmon fishery. Commercial fishermen in California, Oregon and Washington are struggling to stay afloat financially. They say the downturn could force fishermen who depend heavily on crab and salmon to leave the shrinking ranks of the region's fishing fleet. "With this crab season being slim at best, it's going to be pretty hard to make it through to the next one," said 58-year-old Duncan MacLean, a commercial fisherman since 1972. "I would suspect there are going to be lots of people falling by the wayside." The Dungeness season that began in mid-November is shaping up to be one of the least productive in years. In Half Moon Bay, about 25 miles south of San Francisco, MacLean and other crabbers are not doing much fishing because the catch is so poor and prices offered by seafood processors are so low. "It's disappointing to everybody because you want to support your family," said 45-year-old Steve Mills. "Even though we're not catching crab, the bills still pile up." Last spring, federal regulators for the first time canceled the West Coast's commercial salmon season after a near-record low number of chinook returned to spawn in the rivers of California's Central Valley. Next year's season also could be called off to allow salmon populations to rebound. Congress approved $100 million in federal disaster relief to help trollers and businesses that depend on West Coast salmon fishing. Many fishermen say they would be hurting even more without the aid, but they still had been counting on a robust Dungeness season. Scientists attribute the weak crab harvest to increased fishing earlier this year, ocean conditions that disrupted the marine food chain and the natural cycle of crab populations, which tend to peak every seven to 10 years. This season's California catch is expected to fall below the 8 million pounds caught last year, which was down from 25 million pounds four years ago, according to the state Department of Fish and Game. "I'd characterize it as near the bottom of the natural cycle," said Peter Kalvass, a state biologist in Fort Bragg who expects the harvest to rebound in a couple of years, based on the large number of young crabs found in fishermen's traps. In most years, low supply means higher prices, but this year crab fishermen are getting paid less than they got in more abundant years. "The economy is in the toilet, and people that normally buy crabs are not buying the crabs," said Dale Beasley, a fisherman in Ilwaco, Wash., who heads the Columbia River Crab Fishermen's Association. The lack of locally caught chinook, or "king," salmon and the disappointing crab harvest is a loss not just for fishermen but for businesses that draw tourists based on their communities' ties to the ocean. "Our preference would be to sell as much local seafood as possible, and that's becoming increasingly difficult now," said Paul Shenkman, who owns Sam's Chowder House. "A lot of our guests want local fish, and we can't give it to them." Fishermen wonder whether they can afford to keep fishing for a living. San Francisco fisherman John Mellor said he did not receive any federal aid and had been banking on a decent crab harvest to pay for his taxes, boat insurance and daughter's braces. "I have to come up with money to pay these big bills," Mellor said. To get by, fishermen plan to catch herring, squid, sardine, rockfish and albacore tuna, but they say fishing for those species is not as lucrative. The salmon fishing ban and poor crab harvest could force more commercial fishermen to leave the business at a time when the Pacific Coast fleet is aging and shrinking amid increasing regulation, declining fisheries and the expansion of farmed fish. 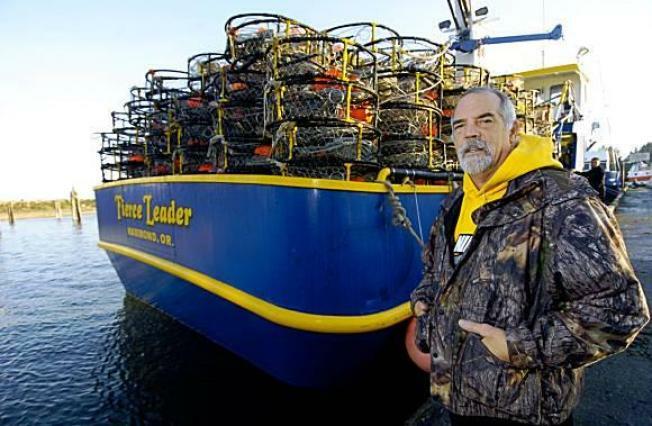 Over the past three decades, membership in the Pacific Coast Federation of Fishermen's Associations has dropped from about 4,500 to 1,000 members, said executive director Zeke Grader. The average age of the group's members has risen from the mid 30s to the late 50s as few young people choose to fish for a living. "People don't think there's a future in it," Grader said.